Anycast is packet based forwarding mechanism where multiple hosts can have the same logical address. DNS is a traffic routing algorithm used for the speedy delivery of website content the advertises individual IP addresses on multiple nodes. Whenever any anycast packet is received it is enquired with DNS to where to send it. DNS provides basically IP address which is the nearest IP configured on it. 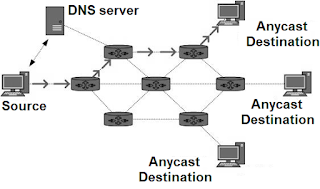 Anycast network routing is able to route for incoming connection request across multiple data centers. When a request comes into a single IP address associated with the anycast network, the network request distributes the data based on some prioritization methodology. The selection process behind choosing a particular data center will typically be optimized to reduce latency by selecting the data center with the shortest distance from the request.